Help index these amazing records!! If you had ancestors anywhere south of the Mason-Dixon line after the Civil War, step this way. Into the richest, deepest, broadest set of genealogical records you may ever find. The records of the Bureau of Refugees, Freedmen, and Abandoned Lands — an agency that because known as the Freedmen’s Bureau. What, you say? Your family doesn’t fall into the category of freedmen? You have no African-American roots? No matter. Because that record set extends far beyond its name to just about anyone who lived or worked in the south in those years right after the Civil War. 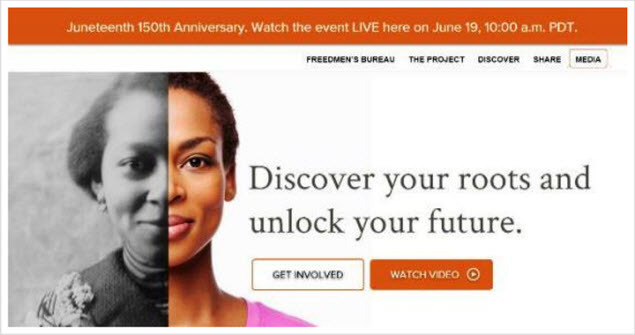 And, starting today — Juneteenth — a major new initiative to make these records more widely accessible to researchers is getting underway — and it needs our help. First off, the records. They are amazing, for descendants of all the slaves and all the slaveowners who struggled to redefine themselves, their lives and their communities after the war. That’s where you’ll find the records, made available by FamilySearch, the Smithsonian National Museum of African American History and Culture, the Afro-American Historical & Genealogical Society and the California African American Museum. Having these records digitized is terrific. So… the initiative. Because just having these records digitized isn’t good enough. Finding our needle in that government haystack is always a challenge — and these records are too valuable not to be mined for every single clue they offer to every American family with southern ties. They need to be indexed… every single name needs to be recorded so every family can know its story. Starting today, in just a few hours, DiscoverFreedmen.org launches an indexing initiative to which each and every one of us can contribute. We did it with the 1940 census. We can do it with the Freedmen’s Bureau records. Today, of course, is Juneteenth: that important historical and joyous celebration that commemorates the abolition of slavery — June 19, 1865, when General Gordon Granger and 2,000 troops arrived in Galveston, Texas, enforcing the freeing of the slaves. Today is when we can access more of these Freedmen’s Bureau records than ever before, with new records from Arkansas, Delaware, District of Columbia, Maryland, North Carolina, Texas, and Virginia joining those already online from other southern states. Today is a good day to join in the effort to help make these records more accessible. So head on over to DiscoverFreedmen.org. Listen to the announcement today of how we can all help make this rich resource available for family research. Let’s all pitch in and get this done. Our families deserve nothing less.